Google proved a goldmine of information for Father Dan’s homilies. On Epiphany, he would explain the Star of Bethlehem this way: the astronomical conjunction of planets in about 6 BCE lined up in Pisces, a constellation special to the Hebrews, sparking the Magi’s trip to the manger. Discussing the Good Samaritan, he’d provide a lengthy historical explanation of the enmity between the Jews and Samaritans. I always figured Google was behind his frequent references to caterpillars, butterflies, and imaginal discs, but it turns out he heard about them from his sister Laura. Laura remembers describing this process to her brother while walking the Towpath Trail a few years ago, one of his favorite hikes. “He looked it up online later. He always double-checked whatever you told him,” she says drily. 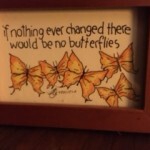 The metamorphosis of caterpillars into butterflies was one of Father Dan’s favorite metaphors, and it frequently came up in eulogies. Someone who heard one of these gave Father Dan a chrysalis, so he could observe the whole process. Everyone knows that caterpillars transform into butterflies, but you may not know that the caterpillar digests itself into a goopy mess first, by exuding enzymes to dissolve its tissues. Resilient cells hiding in that mess grow into adult butterfly body parts. These cells, called imaginal discs, form the eyes, legs, wings, and all the other structures a butterfly needs. A perfect analogy for death and resurrection. Last summer, when Father Dan told me about his cancer and the tough times ahead of him, he found comfort in this image. The caterpillar goes away. It dies. A butterfly arises in its place. He described the whole process to me once again. It’s a dramatic illustration of death, transformation, and hope. 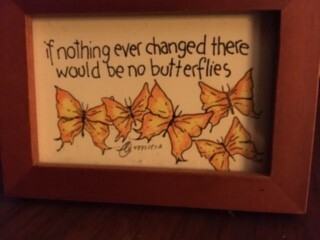 Soon after this conversation, I went to Nashville for my daughter’s wedding and in a little gift shop found this tiny framed quotation: “If nothing ever changed,” it says, “there would be no butterflies.” Wiping away tears, I bought it, packed it in my suitcase, and stopped in at Father Dan’s when I returned to Cleveland. He was just pulling in at his rectory and asked me to help carry some bags into the house for him. They were light, but he had not eaten much in weeks and was already suffering the effects of chemo. He looked at my gift, smiled, and said, “Ah. That’s great.” Then he set it on a table and changed the subject. Giving Father Dan gifts was never very satisfying. He liked reading Atticus, the novel by Ron Hansen I’d given him years before, but we never got around to talking about the great ending, evocative of the Prodigal Son story, which was why I wanted him to read it in the first place. When I gave him a cd of Respighi’s Ancient Airs and Dances, I hoped he’d listen as he drove to his home in West Salem, but then learned he didn’t have a cd player in his car. I never heard what he thought of the music. Material items, even cds of great music, were not what he wanted. “I knew you wouldn’t want my little thing,” I said. “Too bad. I wanted to give it to you.” In the months following, I often thought of it sitting in his living room, and it reminded me of the hope of rebirth. My friend Anita, who works at St. Mary, rescued it from the rectory the other day and returned it to me. It was always really more a gift for me than for him, as he could have told me a year ago. This was written by Kathy. Posted on Monday, June 12, 2017, at 12:05 pm. Filed under Father Dan Begin. Tagged Ancient Airs and Dances, Atticus, imaginal discs, Respighi, Ron Hansen. Bookmark the permalink. Follow comments here with the RSS feed. Post a comment or leave a trackback. Great to see this in print, having seen the real thing! Thanks for this beautiful reflection, Kathy. I miss his homilies. When our son John made his confirmation at St Cecilia he was gifted with a chrysalis. I am sure Fr Dan was behind that gesture. Having known him and his gentle spirit I think I have become just a little better at dying to self. I feel so blessed to have had his witness to joy and faith in my life.